Part 4 of this photo shoot is all Massachusetts! 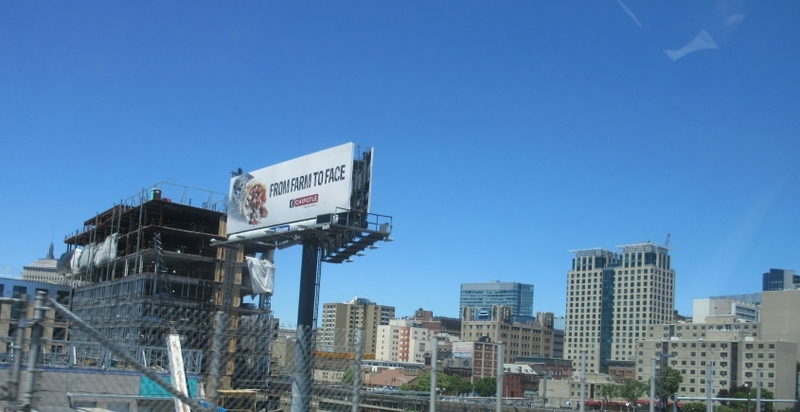 In fact, it's all in or near a major city: Boston! 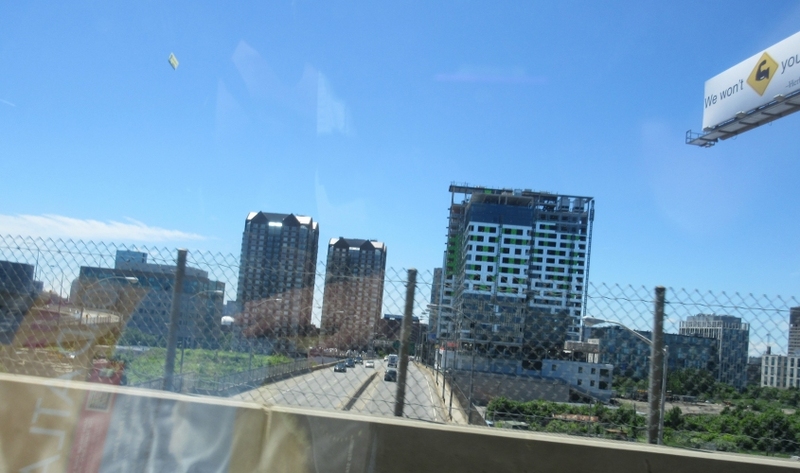 Boston is already coming into view on I-93 in Medford. 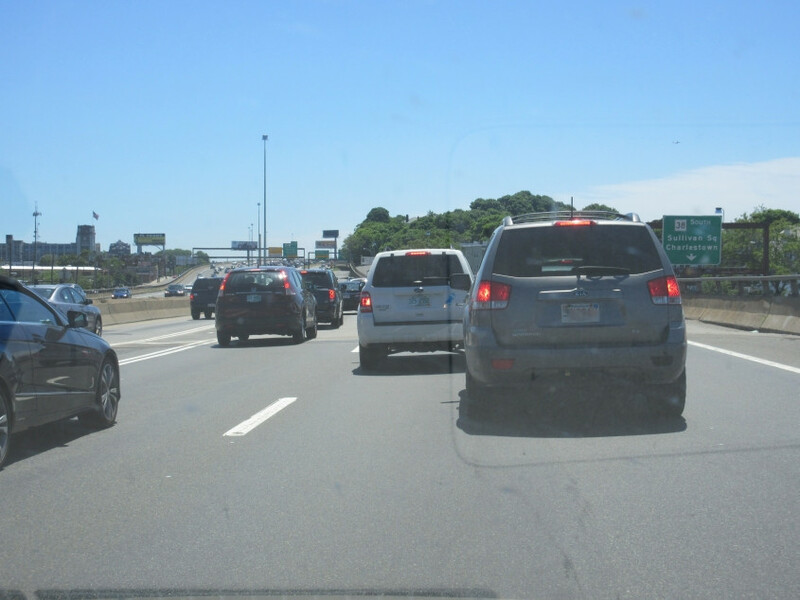 Now we're entering some of that hefty Boston traffic! 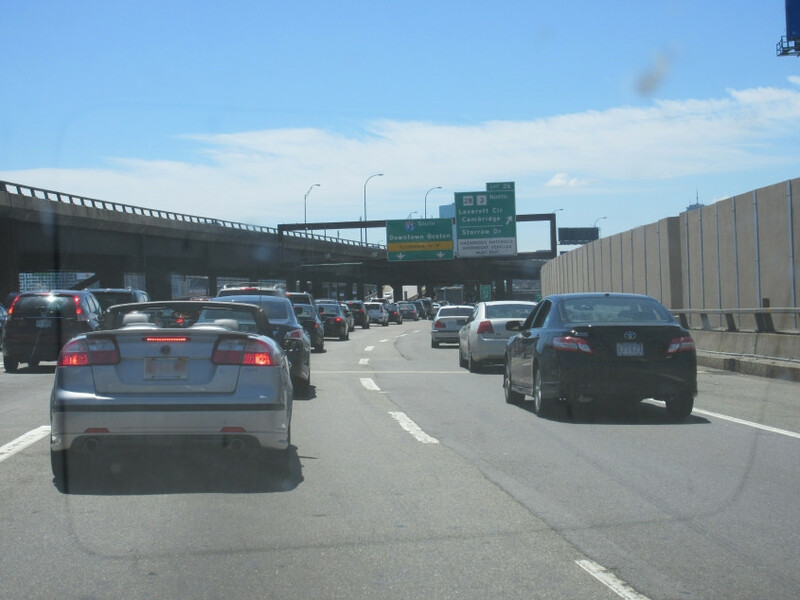 I-93 in Somerville, hometown of "Monster Mash" singer Bobby "Boris" Pickett. 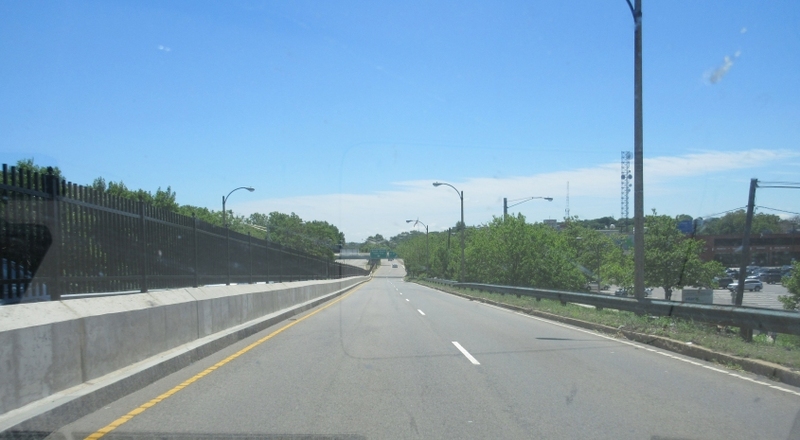 The roadway immediately to the right is a southbound frontage road labeled as MA 38. The street up on the wall to the right of that is Maine Terrace, which curves and becomes Austin Street. 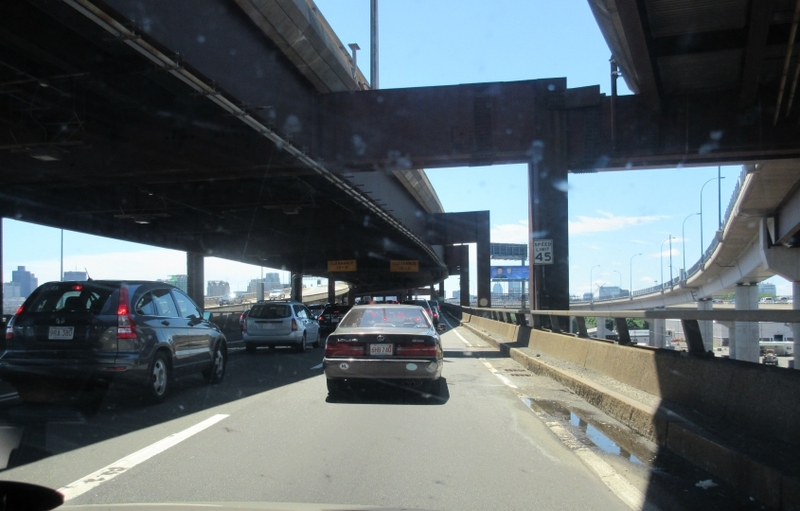 About where we enter Boston, southbound I-93 starts to tuck itself under northbound I-93. You can see the beginning of this double-decker stretch ahead. 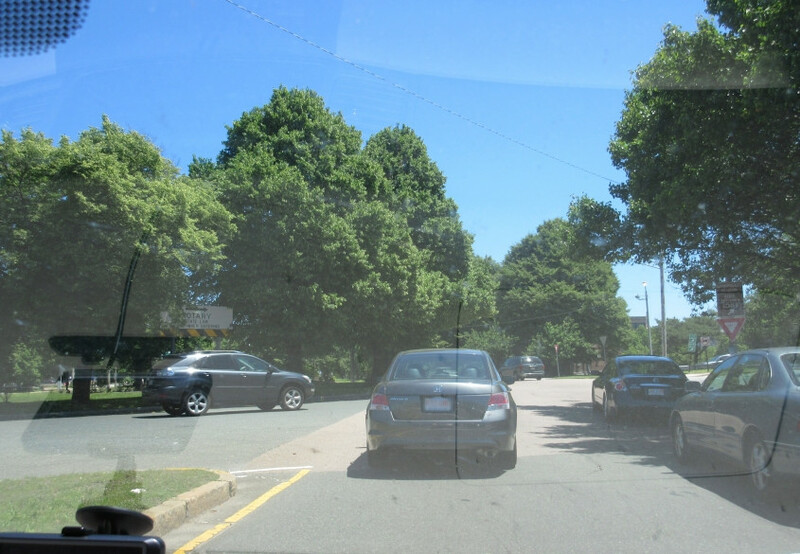 As we start going under the northbound roadway, Google Maps shows that we're also right over a transit station. Now that's a moment and a half! 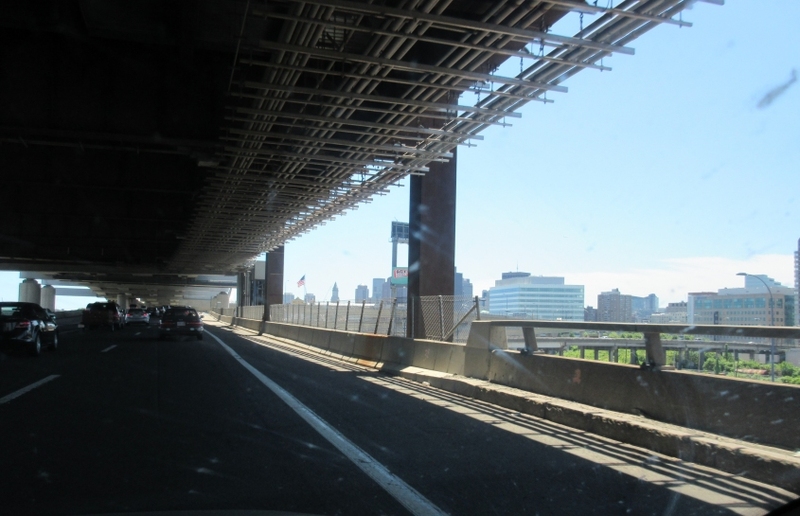 Also, the ramp at right has its own bridge over the Charles River separate from I-93. Continuing under the northbound side. What are the small, round signs for? Each has a faintly visible number - in this case, 15. Also, near the center of the photo, you can see the end of what appears to be a ghost ramp from the upper level. The column at right has another one of those round signs - this one for 14. It's the sign with the bullseye pattern. The deep recesses of the lower deck. According to Google Maps, the bridge you see here is the Gilmore Bridge. 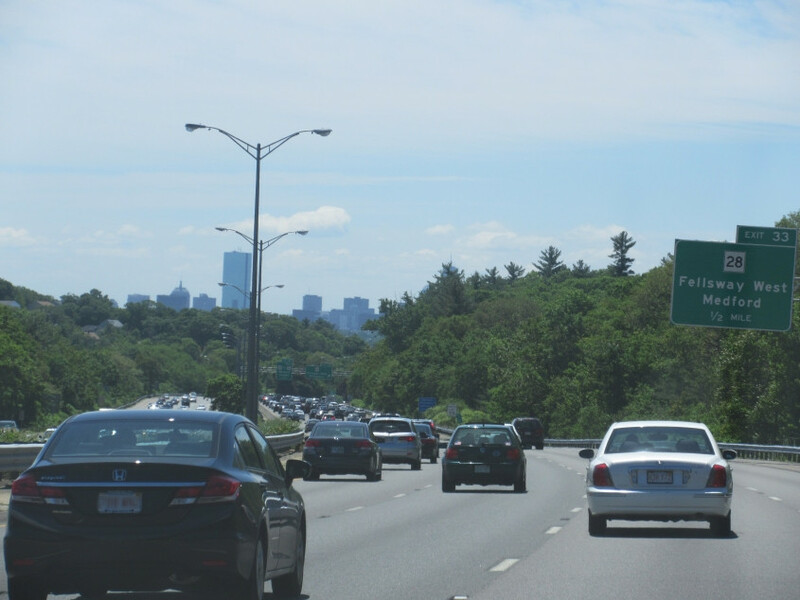 It goes over some roads and railways, but it also goes under I-93. Most of what you see here is in Cambridge. Looking along the Gilmore Bridge into Cambridge. 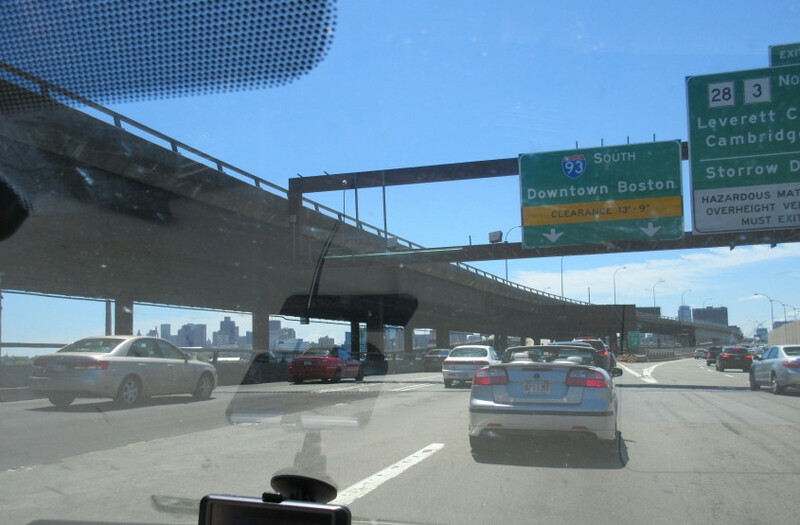 I-93 and US 1 merge as we board the 10-lane Leonard P. Zakim Bunker Hill Memorial Bridge over the Charles River. If you zoom in on the previous photo, you'll notice something interesting. Not bad interesting, but cool interesting. 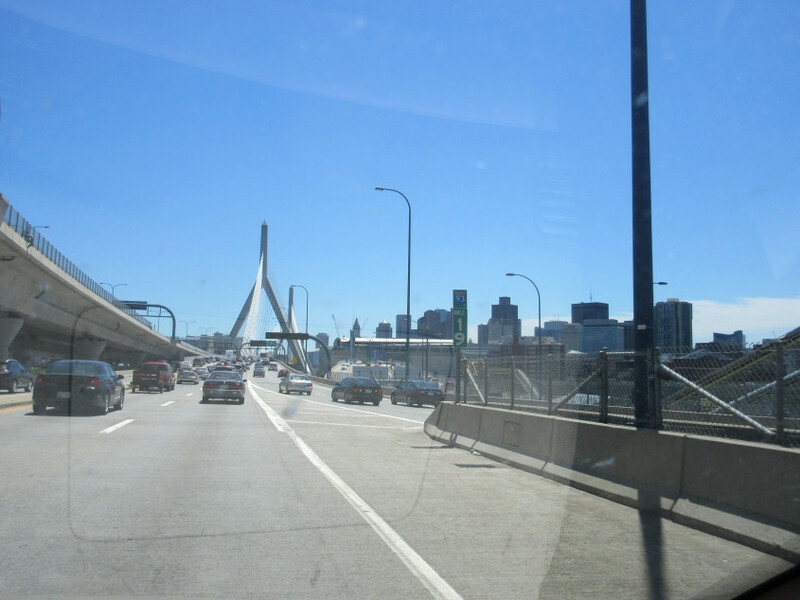 Just to the right of the Zakim Bridge, you'll see another bridge. That's the one formed by the ramp mentioned earlier. It's known as the Leverett Circle Connector Bridge, and it opened in 1999. The award-winning span is the largest steel box girder bridge in the country. 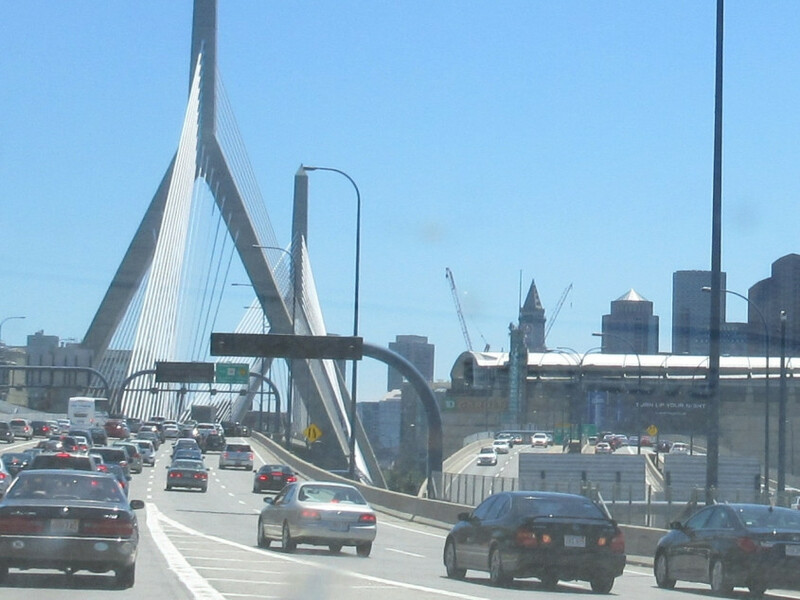 The Zakim Bridge opened in 2003 to replace the Charlestown High Bridge, a double decker that opened in 1954 and was demolished in 2004. What's unusual is that the Zakim Bridge actually has a third roadway off to the side of the main bridge structure. It's also the world's widest cable-stayed bridge. 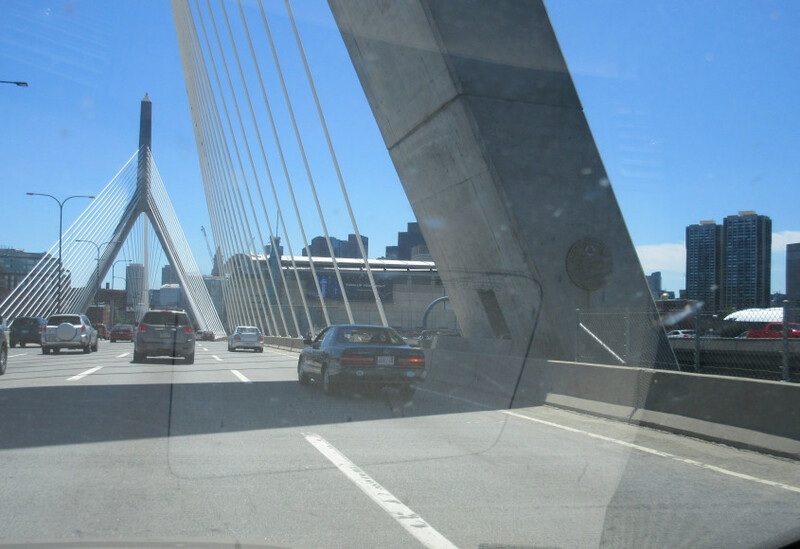 We leave the Zakim Bridge and approach the Thomas P. O'Neill Jr. Tunnel. 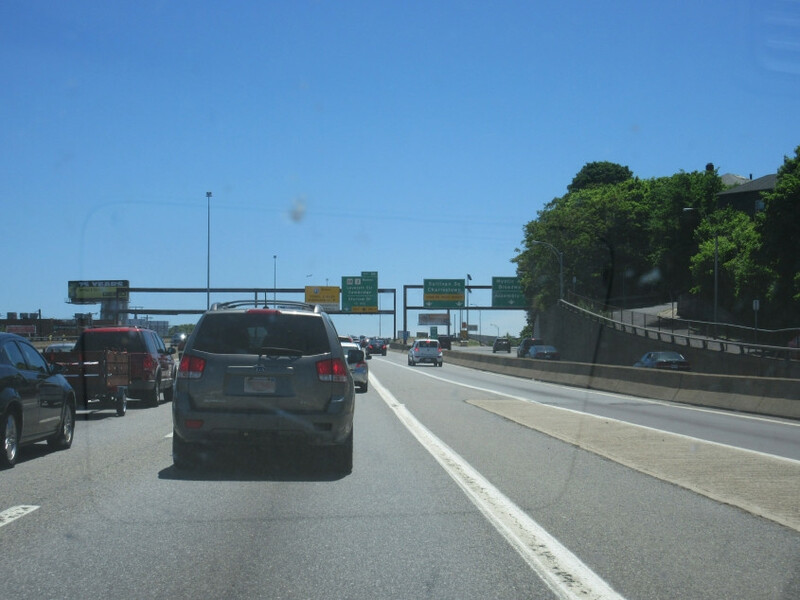 On the right, another ramp squeezes in among the traffic, as MA 3 merges with I-93/US 1. 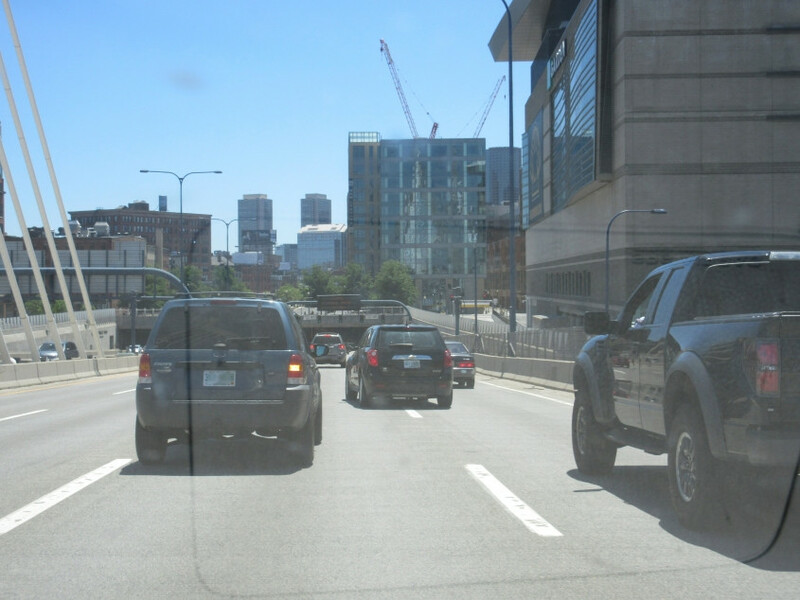 Both the Zakim Bridge and the upcoming tunnel are part of the Big Dig - a gargantuan highway project. It was the most expensive road project in America's history. Planning started back in 1982. 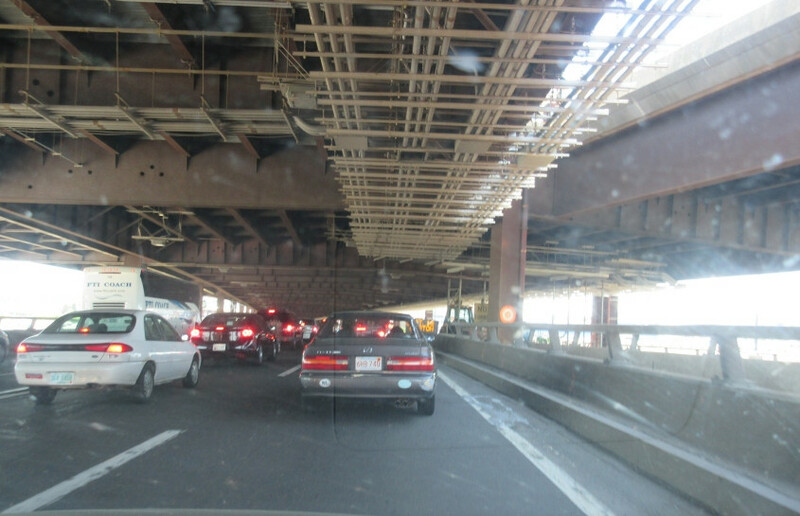 Construction of the Big Dig lasted from 1991 to 2007. Big Dig construction was also known for being carried out very poorly, and completion was delayed for years beyond its scheduled date of 1998. Construction workers who worked on the tunnel found obstacles like sunken ships buried in land that had long ago been built as fill. Flaws in construction also caused the deaths of several people. One of the deaths resulted in a criminal probe led by a prosecutor who had also been involved in a disciplinary hearing against Judge Maria Lopez, who had her own court show. 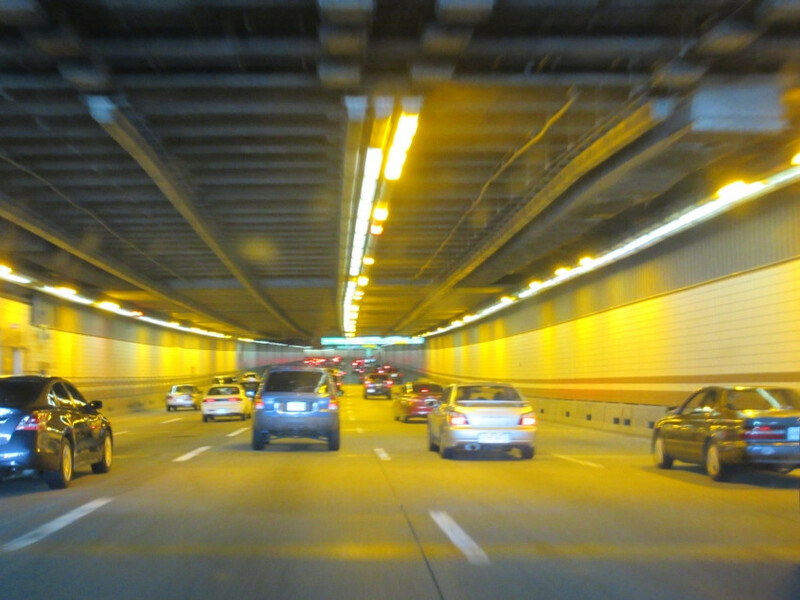 It was later revealed that all 25,000 light fixtures in the tunnel will need to be replaced because of premature corrosion - a task that will take 2 years and require extensive lane closures. The Thomas P. O'Neill Jr. 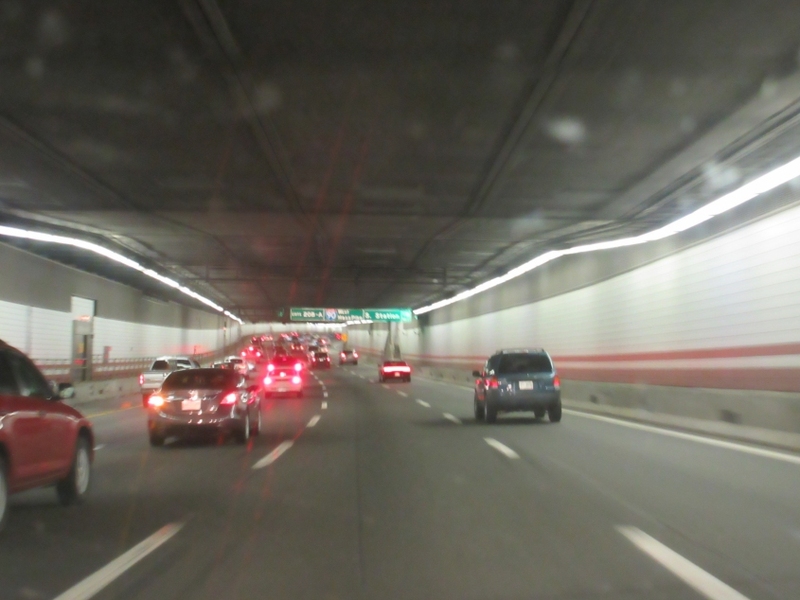 Tunnel was named for legendary Speaker of the House Tip O'Neill and opened in 2003 along with the Zakim Bridge. It runs for 1.5 miles under downtown Boston. It replaces a now-demolished elevated freeway that ran in roughly the same path. 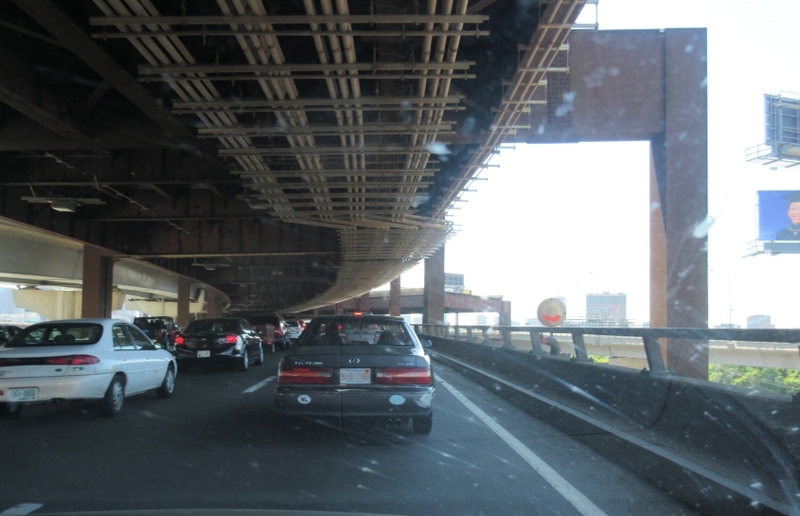 The elevated I-93 opened in 1959 and was known as the John F. Fitzgerald Expressway - and it was I-95 before that route was moved to the Boston bypass in 1974. The site of the elevated road is now green space above the tunnel known as the Rose Kennedy Greenway. The old freeway had been planned since the 1920s. 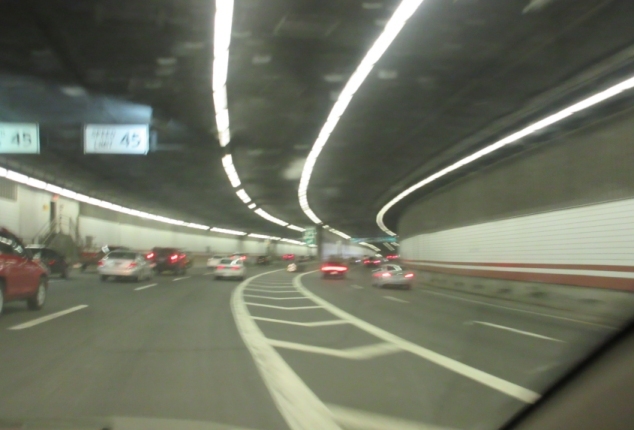 I-93 actually sprouts several off-ramps inside the tunnel. Up ahead is the ramp to MA 1A, which itself uses a dual tunnel servicing Logan International Airport. 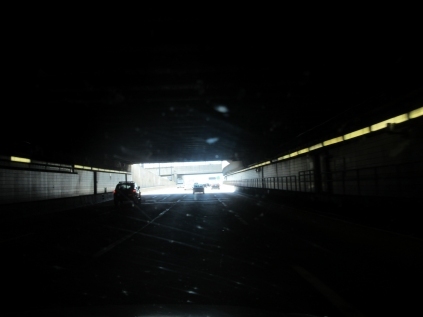 In fact, part of one of the MA 1A tunnels apparently goes under the tunnel we're in! 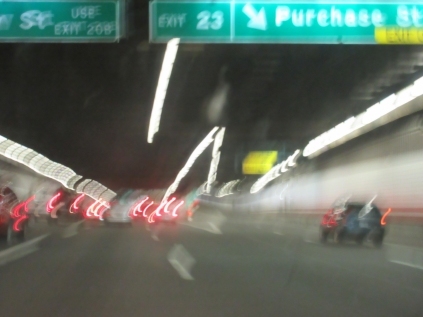 After leaving the tunnel, I-93 has an exit to I-90 - the Massachusetts Turnpike. 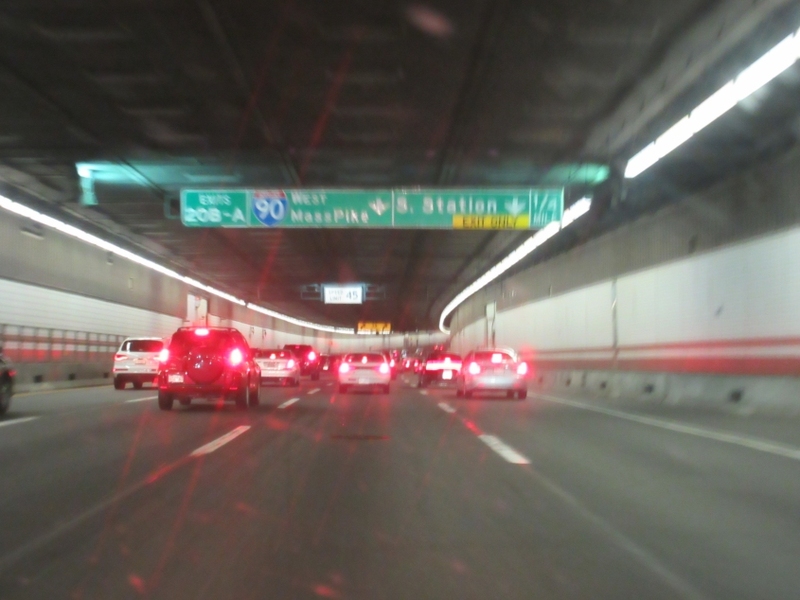 I-90 east of I-93 feeds into the Ted Williams Tunnel - which is also part of the Big Dig. Here, the tunnel splits off a ramp to Purchase Street (like when you buy stuff). 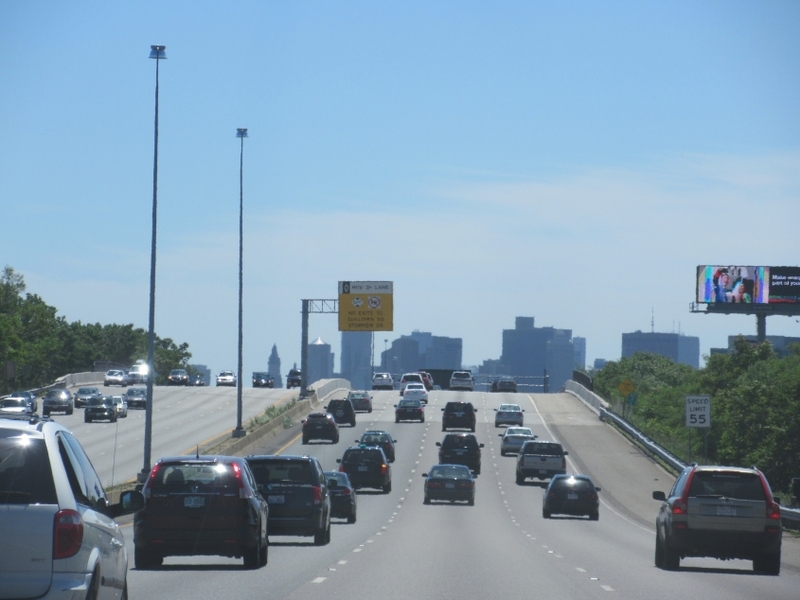 Purchase runs alongside where the elevated I-93 used to be. Although this is an Interstate, the speed limit is 45 MPH. The tunnel splits off another ramp. 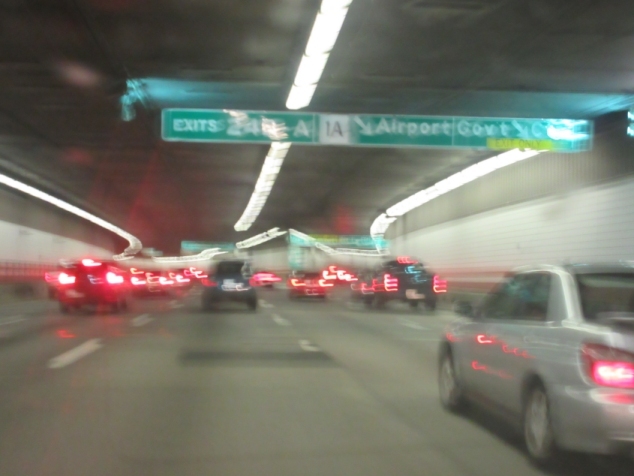 At the south end of the tunnel, the northbound and southbound sides of the tunnel are actually several blocks apart. 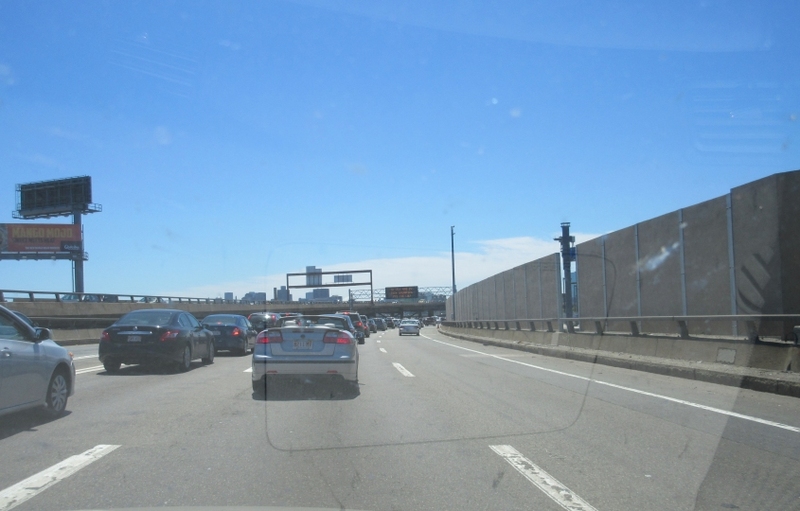 Looking back on I-93 after emerging from the tunnel. Albany Street would be the elevated road on the left. 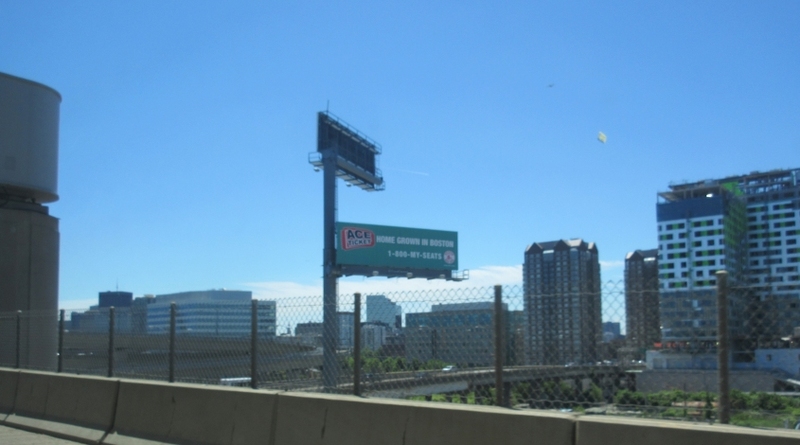 More Boston scenery along I-93. Downtown Boston is huge. This photo has the city's 2 tallest buildings. At center right is the John Hancock Tower, built in 1976. At center is the Prudential Tower, built in 1964. The Pru, as many folks call it, is topped by what looks like a giant mortarboard - but not one of those really goofy mortarboards that are often donned by guest speakers at graduations who have no connection to the school. The rounadabout at Columbia Road, Old Colony Avenue, William J. Day Boulevard, and William T. Morrissey Boulevard. South on the divided Morrissey Boulevard. 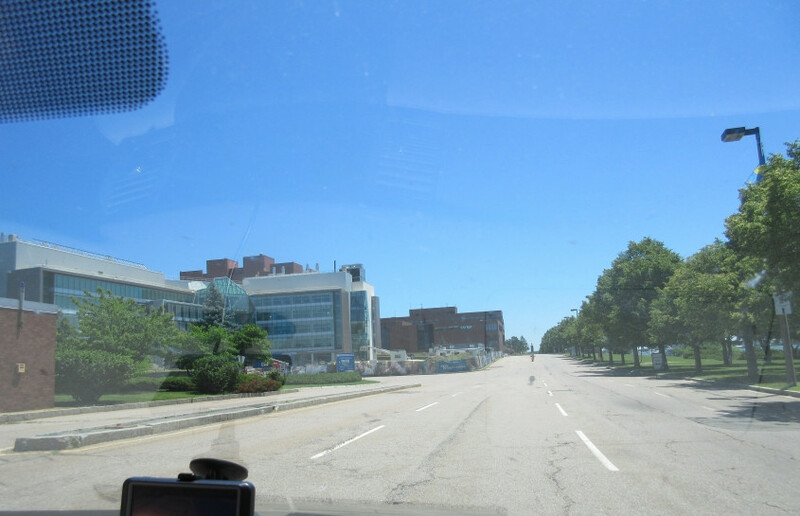 Bianculli Boulevard in front of UMass Boston.